Add dynamic soft body style physics to any sprite in your game! Jelly Sprites allows you to quickly and easily convert boring static sprites into ones that will bounce, stretch and deform, naturally reacting to physical forces from your game. * Works with Unity and 2D Toolkit sprites. * Supports both 2D and 3D physics systems. * Simple to configure, but with in-depth configuration options to let you easily balance quality and performance. * Quickly create sprites with rectangular, circular, triangluar and grid body configurations. * Convert any Jelly Sprite to 'Free' mode in order to directly move and scale rigid bodies in the Scene View. 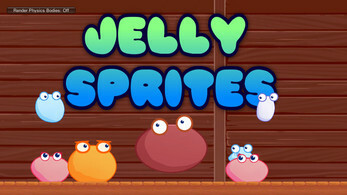 * 'Attach Point' system allows child objects to react to physics forces just like the main Jelly Sprite.